Looking for a way to climb up or down from the attic easier, safer and faster? Then, an attic ladder can be a great option for you. In fact, an attic ladder is of crucial importance to reach attic, hallways or narrow storage spaces in your house. After all, it’s very convenient to use and store. But you need the best attic ladders to climb with confidence. However, a seemingly overwhelming number of options are available in the market. So, it’s not an easy task to find the best one. Here in this article, we have reviewed 7 best pull down attic ladders to assist you in selecting the correct one for your purpose. All of them are of the quality material, good lifting capacity and sturdy enough to serve you years after years. Therefore, whatever your situation and preference are, there is definitely something of your choice. Not every attic ladder deserves the top spot. But Louisville-A229GS is one of those models that easily snatches the top position of this list due to all right reasons. The explanations for positioning it in the top pick is its advanced gas cylinder design. Moreover, the sturdy yet lightweight construction, supplementary insulating segments, impressive loading capacity, and pocket-friendly price make it the winner of this list. 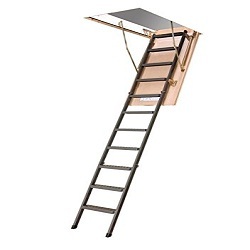 Go to the AA229GS Louisville attic ladder review below. We’ve picked Louisville-S254P as our budget-pick from this list of best pull down attic ladders. Even though it is a budget model, it carries some significant set of features. If you’re on the budget, still looking for a high-quality attic ladder, this Louisville S254P wooden ladder might be the perfect choice for you. The ladder should fit your location accurately. There should be enough space for the bottom of the ladder to move conveniently. Your ladder should match your attic floor and roof framing. Determine the angle of the ladder based on your attic space. If you are not comfortable with handrail, opt for ladder rungs. 54 x 25.2 x 7' - 8' 9"
Louisville is one of the prominent names in the field of ladder manufacturing industry. Their products sharply represent the perfect combination of quality and affordability. 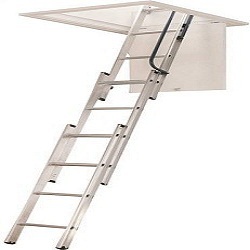 Louisville (AA229GS) Elite Aluminum Attic Ladder is no different. This sturdy yet lightweight model is a solid option to reach the additional storage space in your house. This Louisville attic ladder comes with a wide array of features to turn your attic climbing smoother and safer. Unlike traditional spring mechanism, the ladder includes a gas cylinder. It helps in easy transportation of heavy boxes along with offering more clearance space. This cylinder also ensures smooth opening and closing of the door without much force. The supplementary insulating segments hold the warmth in. Consequently, you get the benefit of lowering electricity bill. There has been a weather strip to protect your house from cold. The ladder can withstand up to 350-pounds of weight. So, whatever your weight is, nothing to worry. You can also carry a decent amount of weight easily with this ladder. Because of using aluminum, the ladder is lightweight yet strong. It can match ceiling height of 7 feet 9 inches to 10 feet. The legs of the ladder are flexible that allows suiting with the floor of any type. The capped feet keep safe your floor from being scratched anyway. Another amazing thing about this ladder is it comes with all the instruments necessary for installing it. So, you won’t have to bear the hassle of extra purchase. All in all, considering the affordability, safety features and ease of use, the ladder is going to be a great purchase for you. Some users complain that the wooden frame is of low quality. If you have a small attic in a tight space where regular staircases don’t fit, this Louisville S254P wooden ladder might be the perfect choice for you. First of all, this ladder is made in the USA. So, you can rest assured about the quality. On top of that, this ladder is ANSI and OSHA approved. What more can anyone demand! As wooden products are never out of trend, many people opt for this option. They are elegant, versatile and you can change their color if you want it to match your interior. You will love the safety features it includes. The sturdy hinges are there to open smoothly and ensure the safety of the ladder. The handrails are very useful to climb up and down comfortably. For absolute safety, the ladder comes with wire rod under each step. These wire rods also contribute to the longevity of the ladder. This Louisville S254P ladder is rated to carry up to 250-pounds of weight. It can match with a ceiling of 7 feet to 8 feet 9 inches. So, if the ladder matches your situation, it’s going to serve you for years after years. For quick and easy installation, the manufacturer provides metal EZ-hang straps. So, the installation will be very easy. Is your house small or rooms are stuffed with furniture? So, isn’t there enough space for a regular staircase? 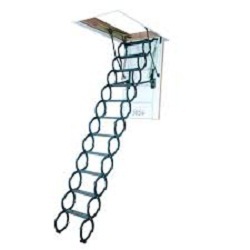 Then, you are going to love this 10-foot attic ladder from Werner. This ladder needs incredibly little space. Therefore, it fits easily in narrow areas. Here sliding design contributes to space saving. This 10 feet ladder er is designed in such a way that it fits in a room with a high ceiling. This ceiling ladder is made up of a few sections that slide one after another. So, you won’t have to do much hassle to use it. When collapsed, the ladder gets hidden behind the door. So it won’t affect your room décor. The steps of the ladder are also pretty wide. 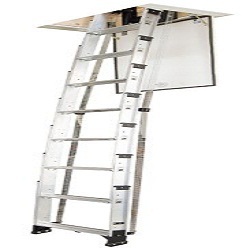 This ceiling ladder is made of high-quality aluminum which makes it incredibly durable. It will withstand all the wear and tear of random use. Moreover, its non-marring feet will safeguard your floor. The ladder can endure the weight of 250-pounds including user and materials. You will be able to install it all by yourself. Additional door needed as the ladder doesn’t include one. Fakro LMS 66869 attic ladder is perfect for high ceiling. With all technical necessities and safety features, the sturdy ladder has gained trustworthiness among users. This folding ladder will easily meet all the expectations you demand from an expensive ladder. First, it’s made of steel and fits accurately into rough openings of 30*54 inches. The ladder is intended to match the ceiling height of 7 feet 11 inches to 10 feet 1 inch. Second, the ladder features powder coated metal. On the other hand, hatch and box frame features high-quality pine wood. Unique opening mechanism of the hatch makes sure that the ladder will open slowly and smoothly. Again, insulated wooden door frame aids in lowering your energy cost. Finally, keeping your house interior in mind, the hatch of the ladder has been colored Beige. So, you can change it to match your room décor. The ladder is esteemed to carry up to 350-pounds of weight which is quite satisfactory. So, you can easily climb on this tough and strong ladder whatever your weight might be. To ensure the highest safety of the user, the manufacturer included anti-slippage formula. The company is offering two years warranty, what else you want! Some users suggest the reinforced corners of the frame. Are you in search of a compact ladder for your hallway, storerooms or some other tight space? Then, this Warner AA1510 aluminum ladder may be the right choice for you. The ladder fits in the ceiling with standard height, which measures 7 feet to 9 feet 10 inches. You will admire the ladder as it includes many user-friendly features. It is lightweight and easy to pull down and push up. Included assist pole makes sure that anyone can open and close the ladder easily and conveniently. The ladder can withstand up to 250-pounds of weight. This amount is enough to fulfill your requirements if you are not going to use your attic ladder for real heavyweight task. As the feet of the ladder are adjustable and non- marring, you can rest assured about your floor safety. Moreover, the installation process of the ladder is hassle-free and straightforward. If you want a trendy ladder for you, you are going to love this Fakro LST 66875 pulldown steel ladder. This accordion ladder gained huge popularity among users mostly because of its trendy look and user-friendly features. The ladder is the best combination of elegance and practical features. As the ladder gets hidden behind the attic door, it doesn’t take any extra space in your room. Narrow spaces where you can’t keep a ladder permanently, this ladder might be the perfect option you were looking for. Its extraordinary design is the first thing that attracts the users most. The S-shaped handrails are the thing that gives the whole ladder a stylish and trendy look. To ensure maximum safety, the ladder is designed with embossed pattern on the step surface which prevents slippage. The stairs of the ladder come with high quality rust-resistant stainless steel. On the other hand, the door and the frame are made of wood. The insulated door frame aids in reducing energy cost. You need not waste your energy opening and closing the door. Thanks to its hatch unique opening mechanism. The ladder has been rated to carry 300-pounds of weight. So, it can handle almost any work. Moreover, you are also getting two years warranty. 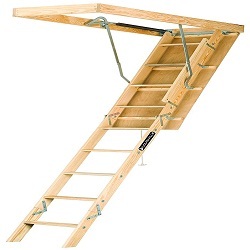 Louisville AA2210, a ladder from Louisville elite series is also one of the heavy duty attic ladders. It’s also one of the popular choices among users. The ladder comes with various user-friendly features which will end your search for one to reach extra storage. This aluminum ladder offers wide clearance than most of the similar products. This feature makes it easy for you to store larger boxes of household or furniture and move them out. Instead of the conventional spring mechanism, the ladder employs a gas cylinder which serves many purposes. Along with wider clearance, the gas cylinder assists in smooth opening and closing of the door. It also eradicates disgusting door slamming. That means the door will remain safe. To maximize the safety of the users, the ladder employs slip-resistant cross tread steps. As the feet of the ladder are adjustable, you won’t have to worry about our floor type. It will fit with every floor type. 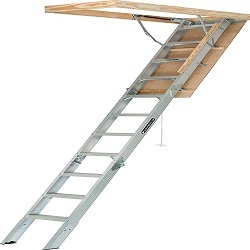 This robust attic ladder comes with an amazing level of load capacity. It can carry 375-pound of user weight easily. So, heavy-duty tasks won’t be a worry with this model. It is designed to fit a ceiling height of 7 foot 8 inches to 10 foot 3-inches which is also exemplary. Finally, the manufacturer provides all the necessary installation hardware. So, you can easily install the ladder. All things considered, it worth your money. 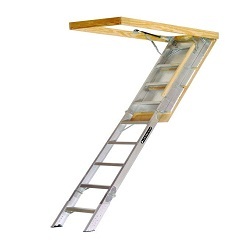 Thanks for reading our 7 Best Attic Ladders Reviews. All the products we’ve reviewed here are unique and popular among users. However, you need to read all the features of different ladders carefully. Certainly, it’ll help you to select one that matches your requirements and budget. Hope our review will assist you in making the right choice. This is the end of our review. But before offering goodbye, we will like to invite you to read our article here to learn about installing an attic ladder. Take a look at our review articles below to find out more.